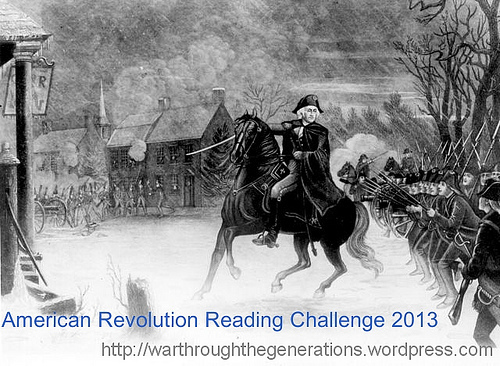 War Through the Generations’ 2013 reading challenge will be the American Revolution. The challenge will run from January 1, 2013, through December 31, 2013. The challenge is hosted by Anna (Diary of an Eccentric) and Serena (Savvy Verse & Wit). This year you have options when reading your fiction, nonfiction, graphic novels, etc. with the American Revolution as the primary or secondary theme. Books can take place before, during, or after the war, so long as the conflicts that led to the war or the war itself are important to the story. Books from other challenges count so long as they meet the above criteria. Dip: Read 1-3 books in any genre with the American Revolution as a primary or secondary theme.